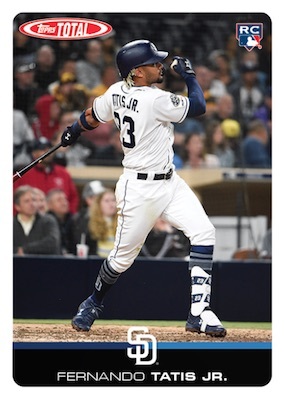 Stressing simple designs and a gargantuan checklist, the massive MLB set is reborn in 2019 Topps Total Baseball. Collectors during the early-2000s likely remember the comprehensive brand and it starts anew in 2019 as a Topps online exclusive. Checking in at 900 cards, 2019 Topps Total Baseball blows away most modern set sizes by a large margin. The design is little more than a white frame with a dark nameplate at the bottom. 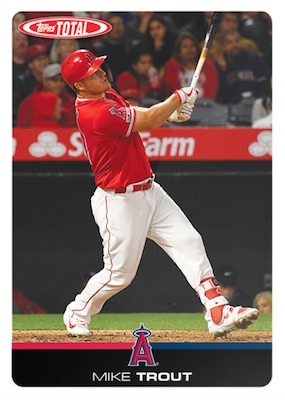 While the 2019 Topps Total Baseball checklist consists of 900 cards, the format is broken down into smaller series or waves. Every three weeks (on Friday), a fresh batch of 100 cards in the set is made available through 10-card packs. These packs sell for $10 each. So, that can get very expensive in the long run. 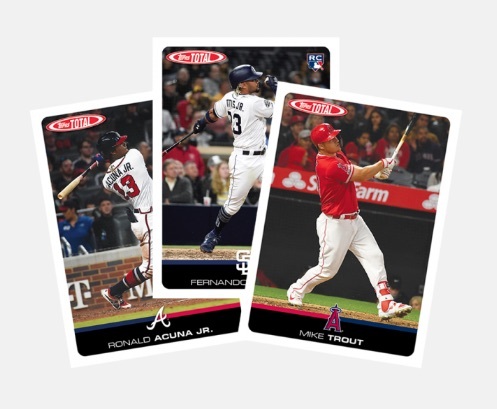 Shop for 2019 Total MLB packs at Topps. There is also a shot at limited base parallels out of 10 and five, plus a one-of-one version. Beyond that, there is nothing else in the set. Without autographs or inserts, 2019 Topps Total Baseball is almost solely about building the huge set. Check back for new details and checklists for each wave. 900 cards in total. 100 cards per wave. 10 cards per pack. Buy packs on Topps. PARALLEL CARDS: #/10, #/5, 1/1. I was thinking more like 10 cards for buck. Is this a late April Fools’ Day joke? I think Topps missed the boat on this one. This is a good set for autograph seekers and set builders, both of which are not going to pay that much. Good set, bad marketing and pricing. Pass on this year’s version. Did I read that correctly? $1/card? That cannot be correct. If so, that is insane. And they don’t even look that good. Topps has too many variations as is. What void does this fill? 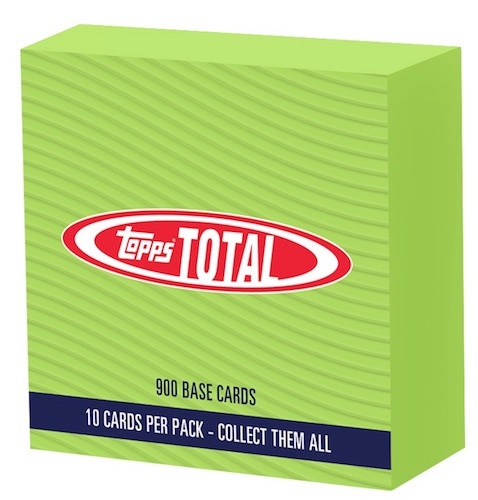 When I heard that Topps Total was coming back I was hoping that it would be something along the lines of a cheap but comprehensive set available either a retail only format or even in hobby but cheap. I hate this online distribution and the price is an insult to what the set used to be. I might go after a team set or two that I want but this is not what this should be. Topps really screwed this up and it would have been an excellent set to use to get younger collectors into set collecting so these large sets they release keep getting purchased. I saw Topps Total coming back and thought to myself, “Cool! It’ll probably be a fun budget release with a huge set to finish!” They did the complete opposite, making it a semi-luxury product where you’re going to have to spend $900 to complete the set, drawn out over the year. This is genuinely insulting, the cards look like a budget release, and they even had the audacity to continue the awful trend of putting a paragraph on the back of the card reminding you it’s from a dumb online-only set. What a joke. I’ll be picking up the singles of the players I collect, but aside from that, this is an absurd product. I don’t know who this is for and I question who thought this was a good way to bring back the Topps Total brand name. Love the idea, hate it’s implementation. $10/Pack for 10 Cards? Topps, are you kidding me? The design & look plus the plain cardboard like vintage cards makes this $10/Pack a robbery. Nothing else special like inserts or autos except for a select few parallels makes this just a waste for consumers. I’m sure Topps are crossing their fingers buyers will flock online to buy but people please think twice before buying into these cards. 900 cards is also ridiculous for a set size. I just know though there will some certain people that will take up the challenge to try & build this complete 900 card set just because they can only get them online so better chances at getting in on each round of 100-card releases. May I ask why people? The card packs are way too overpriced to waste time on trying to build a 900 card set out of these. I won’t be buying a single pack myself. I will take them only if given to me for FREE! LOL!